SKN Prime Minister Dr. Timothy Harris-Prime Minister of Canada Justin Trudeau and Minister of Foreign Affairs and Deputy Premeir of Nevis Hon. 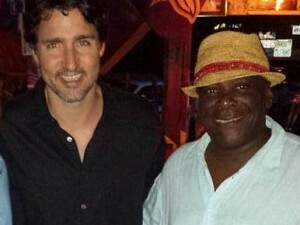 Mark Brantley during Trudeau's recent visit to St.Kitts-Nevis. St.Kitts-Nevis Officials have been actively engaging thier Canadian counterparts in efforts to have Visa-Free waiver for SKN Passport Holders to Canada, reinstated. BASSETERRE, St Kitts (CMC) — The St Kitts-Nevis government says it hopes Canada will restore the visa free travel for citizens which it stopped in 2014. Foreign Affairs Minister Mark Brantley said the Timothy Harris government was making a strong case to restore the privilege for citizens. He said Ottawa had used the change of government in 2015 as a first reason for not restoring the visa-free status. But he said he hoped that the Justin Trudeau government, which has demonstrated a more liberal and inclusive approach to policy matters, including the removal of visas for nationals of Mexico, would respond positively to Basseterre. “My argument is basic, perhaps. If you can allow 120 million people in, what problem do you have with 50,000,” Brantley said, adding “the truth, is as I said to someone, you can take up everybody in St Kitts-Nevis, land them in Canada and nobody would notice.”The foreign minister described the imposition of visa access to nationals as less of an immigration issue and more so “a failure in diplomacy”. He said a reason given by the Canadian Government to impose visa restrictions was the attempt by some nationals of Iran to use St Kitts-Nevis citizenship to avoid and evade sanctions imposed on their country. “But guess what? The world has changed since then and Iran which used to be a pariah, used to be referred to as part of the ‘Axis of Evil’, Iran is no longer that,” Brantley said. A government statement said that discussions between representatives from St Kitts-Nevis and Canada are expected to intensify within the coming weeks. It quoted officials from the Ministry of Foreign Affairs as saying that the island’s High Commissioner to Canada, Shirley Skerritt-Andrew, Monday presented her credentials to Prime Minister Trudeau. “This opens the door for a high-level delegation to visit the country and engage in bilateral meetings,” the statement said. In 2014, the then Denzil Douglas administration had sought to downplay the decision by Canada to impose visa restrictions on nationals from the twin-island federation wanting to visit the North American country, noting that since the September 2001 terrorist attacks on the United States countries have been reviewing their immigration policies periodically. But, Brantley, who was then Opposition leader, said that Canada’s position may have been influenced by an Iranian national holding a diplomatic passport issued by the St Kitts-Nevis government. Brantley reminded nationals then that the Iranian national told Canadian border agents that he was entering Canada for meetings with the Canadian prime minister on behalf of the government and people of St Kitts-Nevis, and that “the claims by the Iranian national of a meeting with the Canadian prime minister were categorically false”.